This charming farmhouse Finca Llucasaldentet is a lovingly and beautifully restored country home, which delicately blends traditional and contemporary features throughout. The house is authentically stylish and benefits from Wi-Fi and air conditioning in the bedrooms. The large grounds outside of the house offer a fantastic private swimming pool and a semi-circular courtyard. 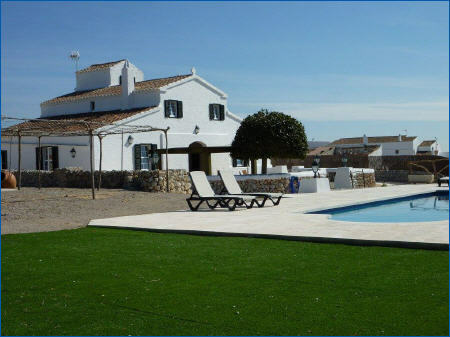 This old �finca� is found in a peaceful location, with wonderful countryside views with the sea in the distance. In accordance with the new Tourist Law passed by the Balearic islands government on 30 March, from 01/05/18 all guests over the age of 16 must pay a touristic tax, known as the `Ecotax´, of 2.20€ (VAT included) per person per night. From the ninth night of the stay, the amount goes down to 1.1€ (VAT included) per person per night. Disclaimer: Unless stated, 1st For Car Hire Ltd does not claim ownership of any intellectual property such as logos, images or video content based on sonbouholidays.co.uk If such content is sourced on this website that may infringe on your copyright, contact 1st For Car Hire Ltd staff for a removal in which we will promptly comply.